August 1 , by Heather Holbrook. I’ve been wanting a digital die cutting machine for awhile now so when the folks at Silhouette asked if I’d like to try one out obviously I jumped at the chance! and even better we get one to giveaway to 1 lucky Craftgossip.com reader. What’s a Silhouette you might ask? Well the simple answer is it’s an electronic machine that hooks up to your computer and cuts out shapes, but it’s really so much more……….. Setting it up: When my machine came I couldn’t wait to try it out but first I had to finish dinner and eat with my hubby, I tell you I couldn’t finish eating fast enough 🙂 Let me admit I’m not the most computer savvy person, I get by but I’m no expert, good thing I’m married to an IT guy, huh? But setting up the Silhouette was really simple, the software was easy to download (I just followed the prompts), plugged it into my laptop, plugged it into the wall, went through the steps in the software for setting up a cut, the instruction booklet took me through all the steps and pretty soon I was ready to start cutting. I was also surprised at how light weight it is, easy to carry from room to room or take to classes or crops. It even uses an SD card so you don’t need to take your computer with you! There are very handy tutorials on the Silhouette website to help with any problems or questions. I found myself using it a couple of times at first and was glad to see all my answers were easy to find. Click here for their tutorials. What it can do: The Silhouette can cut not only papers like card stock (even heavyweight like Bazzill) but pattern paper and vellum. In addition to paper it can cut vinyl (which comes in lots of great colors) so you can make your own cool wall art or home decor projects that are so hot right now! It can cut heat transfer material, also in lots of different colors which comes in smooth or flocked, for custom clothes and fabrics, how cool is that!? You tell the machine the thickness of what you’re cutting (this takes a little trial and error but I quickly got the hang of it) and there are three blade depths to choose from, changing the blade adjustment cap is quick and easy to do. Another neat feature are the sketch pens you can buy, you can replace the cutting blade with a colored sketch pen and instead of cutting out your image the Silhouette will draw it! And one of the coolest features has to be the print and cut feature, you can print images out on your computer and then use the Silhouette to cut them out. You can even use your own images or fonts to cut or print and cut, you really have complete control and freedom with this machine! My favorite thing about the Silhouette is there is no need to go out and buy cartridges which might have lots of images you’ll never use, the software comes with a bunch of free images but when you’re ready for more you simply go to the online store and buy what you want and it’s instantly downloaded into your software! You can buy new images for only .99 cents each or they also offer subscriptions so you can save even more. Click here to visit the online store to see just a fraction of the thousands of images to choose from plus tools, vinyl and heat transfer material. 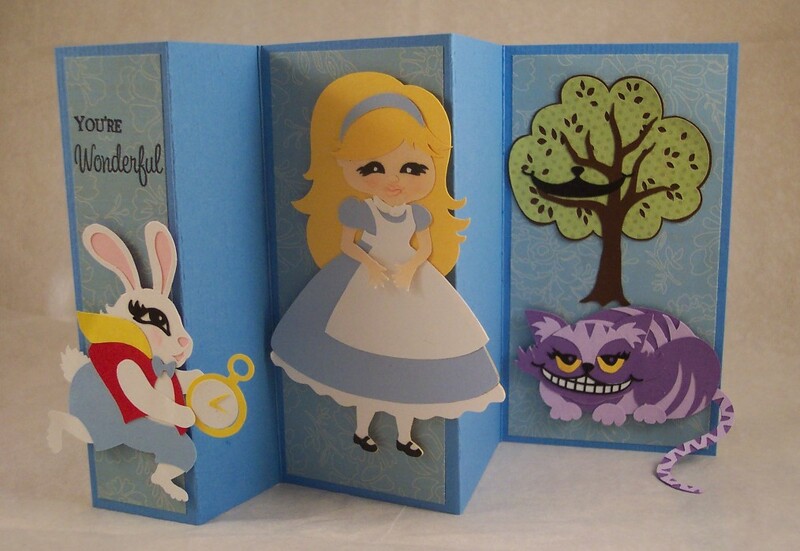 My first project (shown below): If you know me you know I LOVE Alice in Wonderland so I was thrilled to see all the wonderful Alice images (I bought them all!) and so I decided to make a fun accordion fold card with all the cute images I cut with my Silhouette using card stocks and pattern paper. It was easy to customise my images and use only what I wanted, for instance Alice comes with a lollipop but I chose not to use it. It did take me awhile to learn that I could cut just the pieces that I wanted at a time, instead of having to cut all the pieces out each time from the same color, duh! Is there anything this machine can’t do? I adore how my card came out! I want to sincerely thank the people at Silhouette for my new machine, I’m really enjoying it and can’t wait to make lots more great things with it. Be sure to watch for more project ideas from me using the Silhouette. If your looking for ideas, inspiration and freebies don’t miss the Silhouette blog and also check out their Flickr group. 1. Tweet about this giveaway and make sure you come back and give us the link to your tweet via a comment. One extra point if you also decide to follow us – Make sure you mention that in your comment and if you already follow us, then let us know. 2. Share it on your Facebook wall and leave a comment here telling us you have done so (and link to it if possible). 3. Leave a comment on our Facebook wall and leave a comment here telling us so. Like our Facebook page and tell us. 4. Subscribe to our newsletter and leave a comment telling us you have done so. If you are already a subscriber, leave a comment saying so. 5. Link to CraftGossip. Leave a comment telling us where you have created the link to CraftGossip. Competition Open to US winners only. Winner randomly drawn from all the comments and contacted via e-mail. follow this link to find out who won…………….Congrats!! I subscribe to your newsletter and enjoy it.I would love to win this great machine.Thanks ! Wow, I’d love to win this!! I’m subscribing to the newsletter,. So cool, I would love to win. This is such a cool machine. I had never heard of it, but after seeing what it can do it would be great to have.